Sealaska Heritage Institute (SHI) has received a large federal grant to revitalize the languages of the Tlingit, Haida and Tsimshian in four Southeast Alaska communities. The $927,000 award from the Administration for Native Americans (ANA) will fund four mentor-apprentice teams of Lingít (Tlingit), Xaad Kíl (Haida) and Sm’algyax (Tsimshian) speakers and students in Metlakatla, Hydaburg, Sitka and Juneau to study the languages over three years. 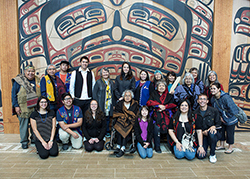 The program, Haa Shuká: Voices of Our Ancestors Through Our Elders, Current and Future Speakers, will build on the institute’s previous language revitalization efforts, including a Tlingit language mentor-apprentice program that recently ended, said SHI President Rosita Worl. Through the grant, SHI will establish a Native Language Committee and appoint committee members from partner communities to serve as liaisons. Each mentor will be teamed with two apprentices, and the teams will immerse themselves in their respective languages over the course of three years. Their studies will be supplemented by language, orthography and transcription courses through the University of Alaska Southeast, which collaborates with SHI on projects through a memorandum of agreement. Intermediate and advanced apprentices will also transcribe hours of language recordings and documents and the transcriptions will be made available to other students through an online database.